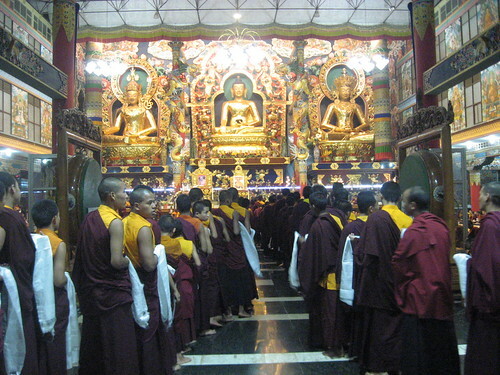 The assembly of Namdroling Monastery in Bylakuppe, India, gathered to make prayers for an auspicious beginning to the new year for all beings. This year is the Year of the Water Snake, 2140. In the morning of the first day of first month. Tibetan calendar, 2137th Tibetan Royal Year, on the Losar (New Year) day, Mugsang Rinpoche lit the golden butter lamp and offered scarves to the three main statues, and to the fearless Lion thrones of both His Holiness Dalai Lama and the late His Holiness Pema Norbu Rinpoche in the main temple. Then they prayed with the monks and recited the Tashi Tsepa (the Heap of Goodness), Thubchog Jinlab Terzod (the Treasury of the Blessings of the Supreme Buddha) and Neten Chagchoe (salutation and worship to the sixteen Arhats) for well beings. After the prayer, headed by Tulku Khenpo and Lama all offered the white scarves with prayer of Rebirth His Holiness Pema Norbu Rinpoche. Then after they visited Zangdog Palri Temple where they received blessings from the holy body of the late His Holiness Penor Rinpoche. Of course, this year we don’t have special celebration for New Year but will focus in prayer and practice.